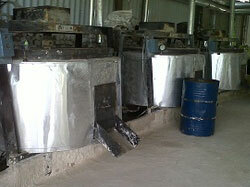 We offer a comprehensive product of Mini Phoshpo Gypsum Power Manufacturing Plant. These are panels that are manufactured using Mini Phoshpo Gypsum Power Manufacturing Plant between other plant . Mini plaster of paris manufacturing plant capacity 25 tons per day with the latest fluid bed technology We are designer,consultant for mini gypsum plant/plaster of paris capacity from 25 Tons ~ 50 Tons per day capacity. Our mini powder production line is highly fuel efficent and designed with latest state of art, technology from Germany and Italy. This plant is designed to provide consistent quality of plasters,useing fluidized bed technology. The plant has the following features.